This was both technically correct and completely misleading: The church's position is that, while Christ will indeed appear at the Mount of Olives, he will also build a new Jerusalem in Jackson County, Missouri, which will serve as the seat of his 1,000-year reign on Earth. Romney had conveniently neglected to mention this part of his church's doctrine. Ever since they made their peace with the federal government and won statehood for Utah more than a century ago, Mormons have strained to overcome their status as outsiders. And Romney's run for president could represent a major step forward in that quest, accomplishing for Mormons what John F. Kennedy's 1960 presidential campaign did for Catholics: signaling that they are finally legitimate players in American life. “There's a feeling that this signifies, in some sense, that we've arrived,” says Mormon historian Richard Lyman Bushman. There's just one catch. Romney has vaulted to the lead in Iowa and New Hampshire largely on the strength of backing from evangelical Protestants—historical adversaries of the LDS Church, not to mention competitors in the worldwide race for converts. Worse, Romney is winning evangelical support by talking about his faith in a way that downplays its differences with mainstream Christianity—in other words, in a way specifically intended to make Mormons' beliefs sound like those of their longtime tormentors. Such rhetoric cannot help but vindicate evangelical feelings of superiority. No wonder a small but angry minority of Mormons are souring on Mitt Romney. Especially irksome to some Mormons are Romney's efforts to minimize the differences between their religion and traditional Christianity—differences that, in some cases, define the very essence of the Mormon faith. In a cover story last month in Newsweek, Romney was asked whether he had ever performed baptisms for the dead, a Mormon ritual in which the deceased of all faiths are posthumously baptized as Mormons in order to permit them to enter heaven. 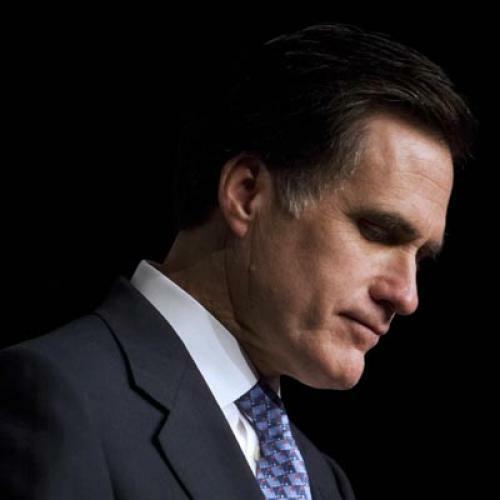 Romney, according to Newsweek, “looked slightly startled and answered, 'I have in my life, but I haven't recently.”” This is not surprising—baptisms for the dead tend to be performed mostly by younger church members—but Romney's response made it seem as though he was embarrassed by an important church practice, one in which many Mormons have personally participated. “Baptism for the dead is really a fundamental Mormon doctrine, and for Romney to downplay it like that did alienate people,” says Boyd Petersen, coordinator of Mormon studies at Utah Valley State College. Even the religious language Romney has adopted on the campaign trail sounds alien to some Mormons. For instance, he refers to Jesus, as evangelical Protestants often do, as his “personal savior." The phrase is not directly at odds with LDS theology, but Mormons almost never use it among themselves—both because it implies a born-again experience not central to Mormonism and because church doctrine, like Catholicism but unlike evangelical Protestantism, maintains that faith in Christ must be matched with good works in order to attain salvation. “I think most Mormons would be a bit puzzled to hear him use language like that,” says Peck. FOR NOW, THE majority of Mormons remain favorably inclined toward Romney—partly because of his role in organizing the 2002 Salt Lake City Olympics, which most regarded as a highly successful coming-out party for the faith. To date, his campaign has raised more than $4.6 million from Utah residents, more than his total haul from New York and Texas combined. And nearlyeveryone I spoke with cautioned that their concerns about Romney are not widely shared in the LDS community. But, as the primaries draw closer, Mormons might well begin to ask themselves if Romney's strategy bodes well or ill for the faith. In this sense, there is perhaps one more parallel between Romney's campaign and Kennedy's. Some Catholic leaders, and at least one Catholic journal, opposed Kennedy in 1960 because they thought that the bargain he had made in order to assuage voters—advocating a high barrier between religion and government—gave away too much. To Catholics who considered strong links between private morality and the public sphere to be an integral component of their faith, Kennedy's election wasn't a sign that Catholicism had become part of the American mainstream; it was a sign that true Catholicism remained anathema to most of their countrymen. This article appeared in the November 19, 2007, issue of the magazine.